Corona-maker Constellation Brands recently announced a $US4 billion investment in Canopy Growth Corp., the world’s largest publicly traded marijuana company. For the second quarter, Constellation topped Wall Street’s expectations and shares rose as much as 4.5%. Follow Constellation’s stock price in real-time here. Constellation Brands, the owner of Corona that recently announced a $US4 billion investment into the world’s largest publicly traded marijuana company, reported second-quarter earnings that topped Wall Street expectations and sent the stock surging by as much as 4.5% in early trading Thursday. A booming beer business helped fuel the beat, with an operating margin of 41.3%, up 10 basis points from the previous period. Wine and spirits, on the other hand, declined 20 bps to an operating margin of 26.1%. Beer brought in approximately three times the operating income and net sales as wine and spirits. 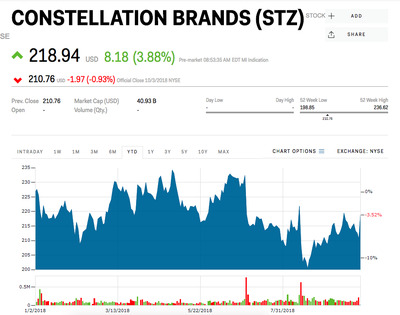 In August, Constellation Brands announced a $US4 billion investment in Canopy Growth Corporation, the world’s largest publicly traded cannabis company, adding to its previous stake bought last year. Constellation’s chief executive is standing by its foray into the nascent market. “Our $US4 billion investment in Canopy Growth provides us with a strong foothold in the emerging global cannabis market, which could be one of the most significant growth opportunities of the next decade,” CEO Rob Sands said in a press release. Constellation is now the largest investor in Canopy, and its ownership could hit 38% once the transaction is complete. Canopy Growth’s CEO Bruce Linton explained to Business Insider in July why alcohol brands and cannabis companies were a perfect match. Constellation is scheduled to host a conference call with Wall Street analysts at 10:30 am Thursday – and cannabis is likely to be high on their list of questions.